The conditions in which insulating oil is used in transformers, switches, and other high voltage equipment are rather demanding on the performance characteristics of the insulating oil. During the service life of the oil, it is heated by currents, contaminated by particles of solid insulation and chemical reactions with the internal surfaces of the equipment. Each of these separately and together significantly accelerate the aging of transformer oil and can make the oil harmful to the equipment. This is especially true with regards to the transformer insulating paper. A sample of transformer oil is taken from the lower part of the transformer oil tank after rinsing the drain opening with oil. The sampling vessel must be clean and very dry or the testing results will not reflect the true condition of the oil being tested. Local and international standards define certain parameters by which the oil must comply. Oil analysis and testing should be performed directly before placing oil into the electric power equipment. Before a transformer is energized, the oil in the transformer must be briefly tested for minimum dielectric strength levels, solid particulate matter, acidity and flashpoint. If different brands of oil are used in the transformer, the final blend must be tested for stability. The blended oil fill should not be inferior in stability to any of the separate oils with the lowest stability value. Used oil must be tested according to standards that have been set for the operation of industrial equipment that it will be used in. Before testing, the vessel, containing the oil sample, is inverted and turned slowly around several times to eliminate air bubbles from the oil sample. A ceramic oil test vessel with electrodes is filled three times. Oil is poured on the walls of the vessel in a thin stream so as to prevent formation of air bubbles. The level of oil in the vessel must be at least 15 mm higher than the top of the electrodes. Transformer oil is allowed to settle in the vessel for 15-20 minutes for air bubble removal. The voltage is then gradually increased at the rate of 1 – 2 kV per second. After a breakthrough is achieved (spark between the electrodes), voltage is recorded and then dropped to zero. Six tests are performed and the average of the last five tests is taken. The first breakthrough is not averaged in since it was only performed as a guide. After each breakthrough, carbon particles are removed from the space between the electrodes by clean glass or metal rods. The liquid is then allowed to settle for 10 minutes before performing the next test. 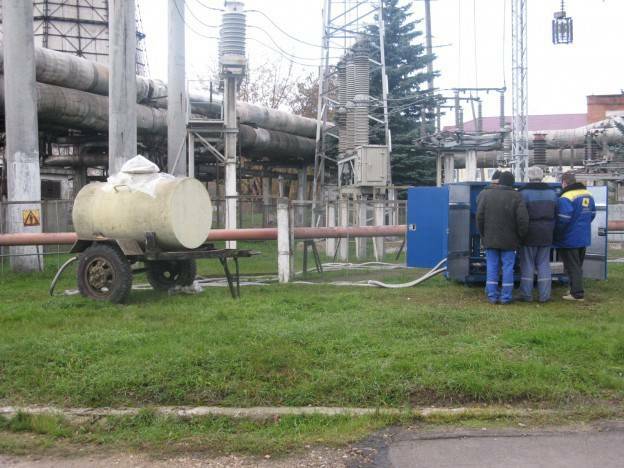 The transformer oil sampling process will vary from facility to facility depending on the equipment used and purity requirements of the equipment and oil being tested. At any rate, a timely oil analysis program may well prevent significant costs and losses for your company.